Book Update: I’ve read more of Sonja Lyusbomirsky’s work on positive psychology on my own. Her conclusions on happiness are really interesting and go against a lot of what we are “taught”. One example that comes to mind is the phrase “Don’t Sweat the Small Stuff.” Because, truthfully, we do sweat the small stuff. The little things that add up over a day, week or month that are so trivial that you have to bottle them up inside. Or the fact that money does make us happy – but after about $50,000 per year most of it doesn’t really matter how much more you make. It won’t make you any happier. I also learned that most studies showed people felt increased happiness much more when buying little things more often than one big splurge. Personally, I think this is true and I think it helps actually control spending as well. If you splurge on a $5 coffee, then refrain yourself from a large purchase later – then you may have saved yourself more money in the long run. I believe the study also comes from the fact that we are off our “high” from the big splurge several hours or days later, but if you have little splurges over a longer period of time, then you keep your level up. 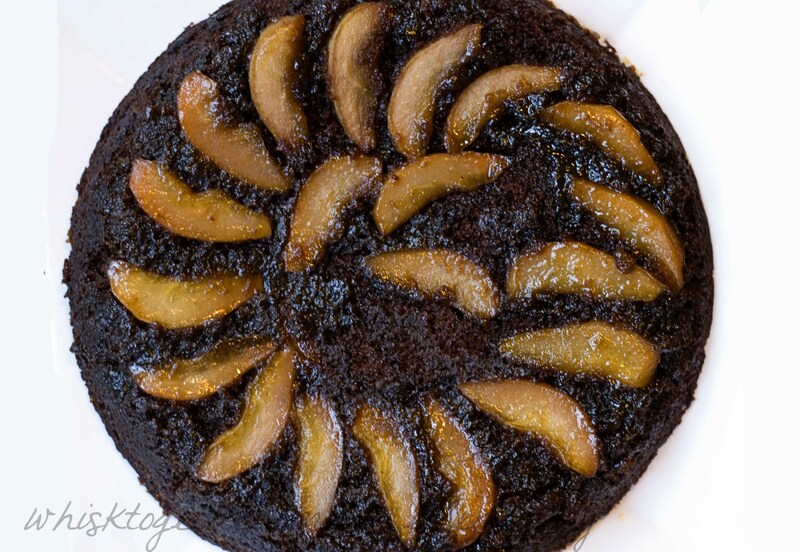 Recipe: My friend Alison (the one in the previous post who likes happy endings) made this outstanding Upside-Down Pear Gingerbread Cake. The cake was very, very moist, and the molasses smell wafted throughout the house. 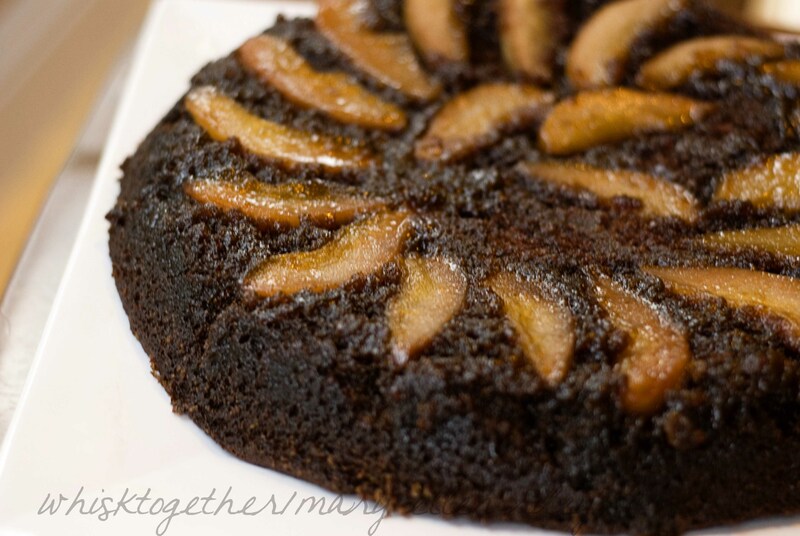 If you love those soft molasses cookies or the Martha Stewart Chocolate Molasses cookie, then you would like this cake. The cake reminded us a lot of Fall and Christmas and gingerbread cookies. 1. You will need a 10″ cast iron skillet or a non-stick 10″ skillet that is oven proof to 350 degrees. 2. First, we need to make the topping. In the skillet you will be baking the cake in, melt the butter. 3. Over low heat, sprinkle the brown sugar all over the pan evenly and allow to melt without stirring for 2-3 minutes. Next, lay the pears down into the sugar mixture and cook another 1-2 minutes. Remove from heat. 5. Whisk Together in a medium bowl the dry stuff: flour, baking soda, cinnamon, ginger, cloves and salt. 7. In your large mixing bowl: beat the butter and sugar together for 2 minutes until light and fluffy. Add your egg and incorporate that in. 8. Now alternate adding the flour mixture and molasses mixture in on low speed. Remember that in general you always start and end with the flour mixture. 9. Pour this cake batter on top of the pears in the skillet. Spread evenly. 10. Bake 40-50 minutes. Cool 5 minutes to allow the cake to contract a little. 11. Run your knife along the edge of the cake to help it release. Then take a really large plate and put it over the skillet to flip the cake onto the plate. 12. If some of the pears stick to the skillet, simply and carefully replace them.